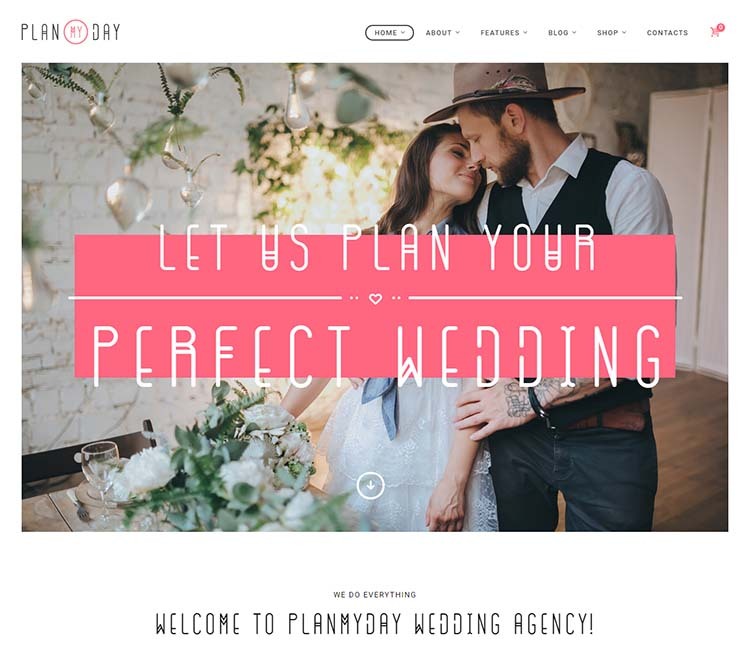 In today’s roundup, we get a bit mushy about the best wedding planner WordPress themes for 2019. 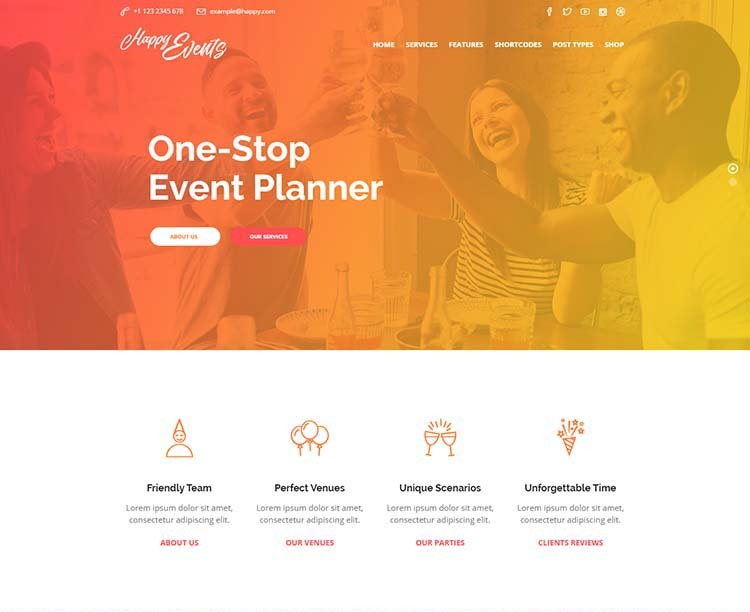 Event planning and wedding agencies looking to launch or spruce up their web presence using WordPress can’t go wrong with any of the themes on this list. When making our selections, we went for quality, industry-appropriate design–these products were conceived and developed especially for wedding planning and event planning agencies. Although there’s plenty of generic, free business themes you could massage and customize into a wedding planning website, these premium products are fairly priced, and we think they’ll save you time and money in the long run. You’ll ideally start impressing potential clients the moment they land on your site. The must-have features are fairly standard. Contemporary functionality, like responsiveness, are essential. You stand to lose a lot of business if users can’t adequately browse and use your site on their iPhones. For some wedding planning agencies, WooCommerce support will come in handy: you can take payments and sell products directly from your site. Note: If you don’t find what you’re looking for here, you might also find our collection of the best small business themes for WordPress useful. 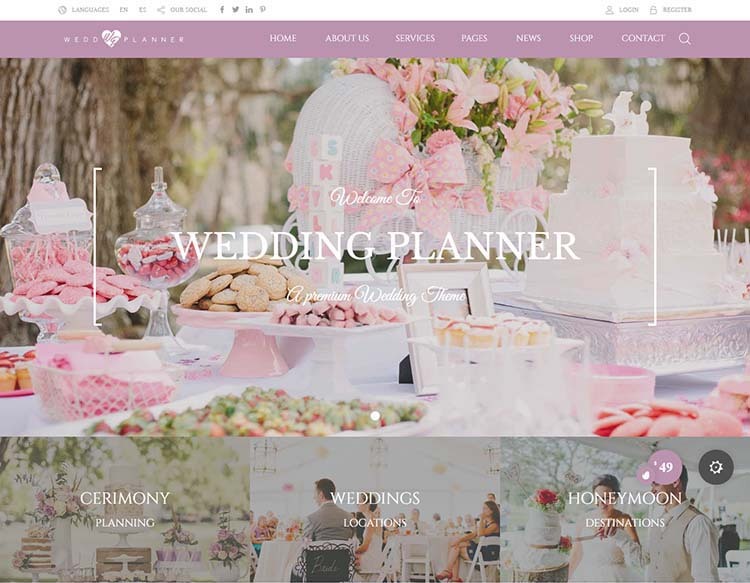 Now let’s look at a few of the best wedding planner WordPress themes. 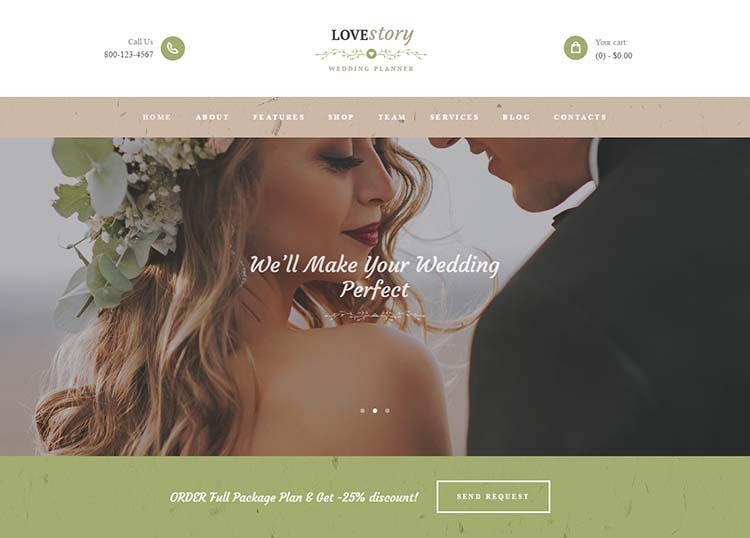 Our favorite WordPress wedding planner theme is Love Story. This theme features a gorgeous, elegant, and contemporary design. Although it was developed especially for wedding planning agencies, it can easily be adapted for use by other types of event planning companies. The theme bundles several premium extras free. Visual Composer is included, allowing webmasters to codelessly create and manage complex layouts. Love Story provides two sliders: Swiper Slider, and the omnipresent and popular Slider Revolution. Essential Grid is also included. A useful set of custom widgets and custom shortcodes are built-in. The theme supports WooCommerce, for shopping cart functionality, and is WPML compatible to help with translation efforts. Usability tweaks like AJAX searching improve UX further. The theme is performance optimized, easy to customize using the admin options panel, and nicely documented. Well supported and regularly updated. Highly recommended. Our next spot goes to Plan My Day. The design is clean and modern, with an aesthetic the developer accurately describes as “tender”. Once again, this one can be used for other sorts of event planning companies – birthdays, banquets, etc. Visual Composer and Revolution Slider are packaged free, and like Love Story (above), WooCommerce integration provides the theme with e-commerce and online storefront features. Three presets/homepages are available to choose from, and plenty of options are built-in to help you with branding and customization. You won’t need to touch the code at all to adjust fonts and colors. Plan My Day is professionally supported and fully responsive for display on mobile devices. 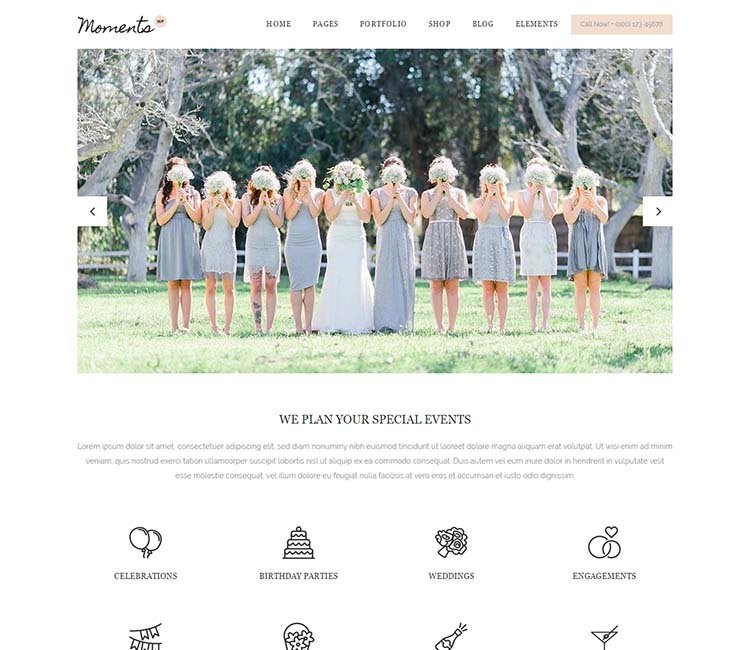 Moments serves up a light, airy design perfect for wedding planning agencies. This is a multipurpose wedding and events theme. It’s the most versatile choice on our list, with 18 distinct homepages to choose from. The included invitations and announcement features are a nice touch, as well as some engaging visual flourishes, like video backgrounds. As might expect, WooCommerce is fully supported, and Revolution Slider and Visual Composer are bundled free. The expertly crafted code is optimized for both performance and search engines, helping you to secure a solid Google ranking and increase traffic to your website. The theme is retina ready, meaning it supports high-resolution displays: graphics will look crisp and sharp no matter where you view it. There’s also a powerful options panel for managing typography, colors, and all that cool stuff. Wedding Industry is one of the best-selling multipurpose wedding themes of all time. As such, it’s a bit older than a few of our picks, but you wouldn’t guess it from its modern design and cutting-edge feature set. This theme is regularly updated and expertly supported by its developers. 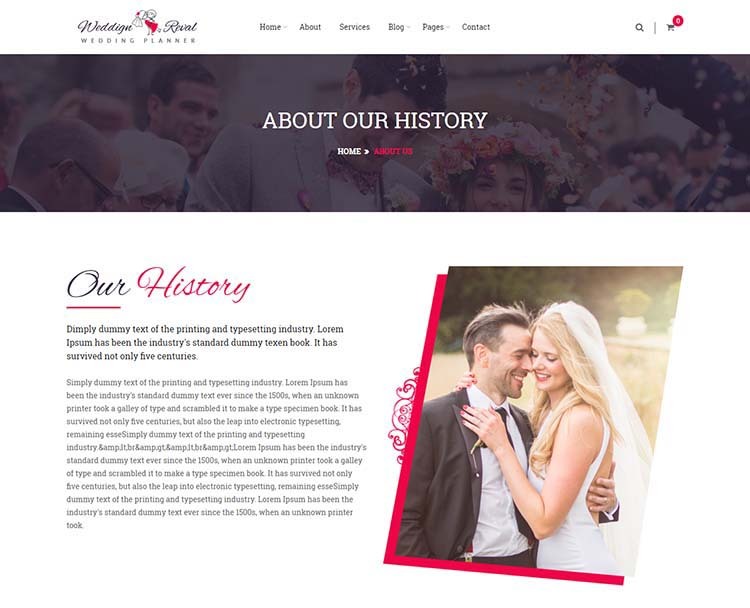 Like the Moments theme, Wedding Industry offers a variety of homepages to choose from out-of-the-box. Intuitive, drag-and-drop page building functionality comes courtesy of Visual Composer, and the options are powered by the WordPress Live Customizer. Tweaks and adjustments you make to the elements can be previewed in real-time. The screenshot of Forever doesn’t quite do it justice – if you have a minute, I’d suggest clicking through to the product page and checking out the demo. (There’s two demos, and one specifically tailored to wedding planning agencies.) The design is minimalistic, and features an elegant, stylish aesthetic. On the tech side, Forever is high-resolution, providing crisp graphics on the latest retina devices, and fully responsive to guarantee consistent user experience on smartphones and tablets. The valid, clean code (built on Twitter Bootstrap) is SEO friendly and performance optimized. And, wouldn’t you know it, Visual Composer and Slider Revolution are packaged. Contact Form is supported for building custom web forms. There are also lots of options to tweak and adjust. The one click demo installation make set up fast and painless. And now for something a little bit different. 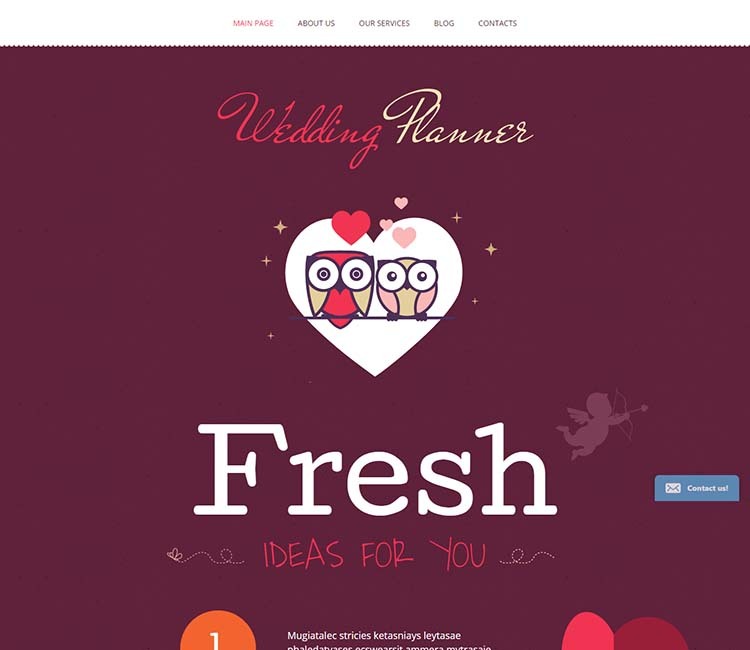 The aptly titled Wedding Planner theme makes a bold visual statement. Cute graphics, rich colors, and large, striking typography ought to make a memorable first impression on your visitors and future clients. The theme is fully responsive, for flawless performance and UX on the full spectrum of mobile, laptop and desktop devices, and is easy to customize using its built-in options panel. All custom post types are supported, 80+ practical shortcodes are bundled, and the theme is multilingual ready with WPML compatibility. Wedding planner is SEO ready, and includes lifetime free updates. 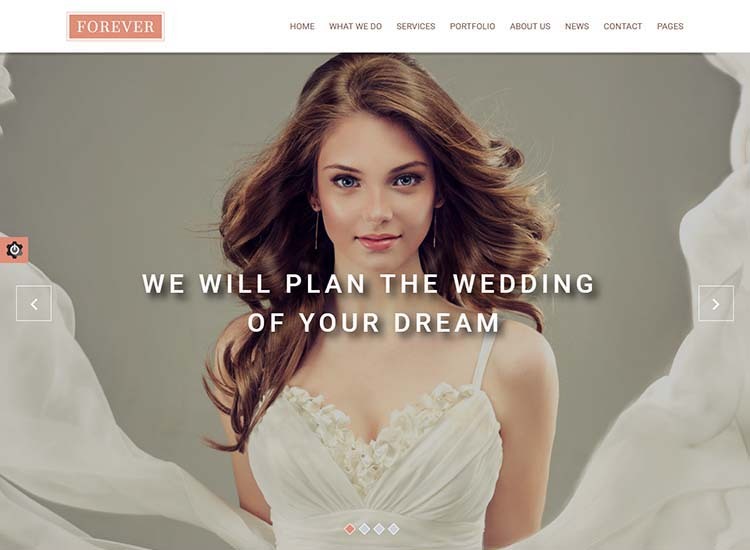 Wedding Reval is a WordPress wedding planner an agency theme with two homepage variations, a lovely, artful design, and a page builder for creating and editing additional complex layouts. Its support for third-party plug-ins Contact Form and WooCommerce is well implemented. 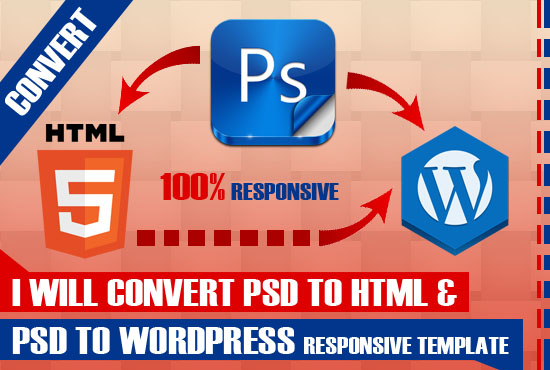 The theme is 100% responsive, and translation ready with WPML support. Finally, that brings us to Happy Events, which takes a slightly different approach with its business-oriented, general event planning design. This is a perfect fit for event planners who don’t only handle weddings, but other events like holiday celebrations, anniversaries, and parties. This one includes one particularly useful feature the others omit, a cost calculator. Support for the Events Calendar plugin is also a welcome touch. Of course, it also includes the usual array of secondary features, like Revolution Slider, custom shortcodes, and custom widgets. It’s responsive, retina ready, and SEO optimized. Webmasters can make their adjustments and customizations via the built-in options panel. Customer support is helpful, friendly and prompt, and the developers have put together a detailed knowledgebase to help you get the most out of their theme.